Most people will end up going for the tradional playdough recipe. It works well, is easy to make, and is the same recipe your grandmother made. There are however alot of other playdough recipes to choose from and some examples include Jello playdough recipe and Cream of Tartar Playdough Recipe. 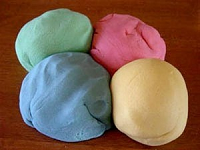 This is a really simple playdough recipe, just follow our explanation. Mix the ingredients with a fork until smooth. The whole procedure takes about 4 minutes, quick and easy fun! When finished, store in airtight container if you want the playdough to last longer. Feel free to try another of our playdough recipes, we have plenty to choose from! The traditional playdough recipe is really simple with few ingredients and steps, but it’s even easier with our extended step-by-step explanation with images. We gather the ingredients, baking soda, corn starch, water and food coloring. The food coloring isn’t needed to make the playdough, but the playdough will look really boring without it. 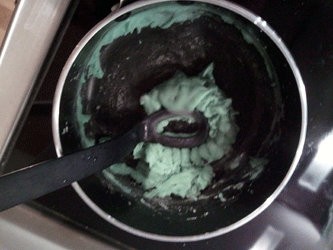 Here you can see that I’ve mixed all ingredients but the food coloring. The color is quite boring and some green/blue/red would really make a difference. So, to please the crowd I added some green food coloring. You can pick whatever color you prefer. 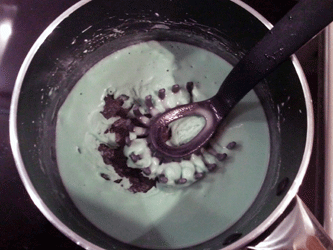 After heating the mixture for a minute or two, it will begin to look like this. From this point it will only be a quick moment until the playdough is finished, so be aware. 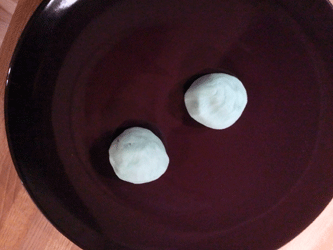 Here you can see how it should look when the playdough is finished. It holds together really well. It’s still hot so don’t pick it up with your hands, just place it on a plate using a spoon or similar. My finished playdfough looked like this. Nice and greenish, ready for your imaginative creations. Good luck! Just made this with my daycare kids. They had a blast, and it was so easy! Much nicer than the salt recipes! I tried this, and it turned out a mushy gross mess. It feels sticky, too. did i do something wrong? Too much water maybe? Did you use standard corn starch and baking soda? This worked so great for me! My son is allergic to wheat so I can not use the traditional flour recipes. Thanks for putting this up! I just made two batches of this recipe. Both turned out a sticky concoction. It looks like it holds together, but it is very sticky and would be a mess to play with. It looked like such a nice recipe, but it didn’t work for me. back to salt/flour playdough. If it’s sticky, try cooking it a bit more, or add some more cornstarch. If a playdough is sticky it’s mostly a question of working against the added water. But it was good when you first made it? Did you store it in something airtight? It can dry out quickly. If it was dry/crumbly to begin with, add some more water. About to try this 🙂 Can you mix the food coloring in at the end? I would like to do a few different colors, and I’d like to avoid having to make multiple batches. Thank you! Absolutely, you just need to knead a bit more to spread the color. Fab recipe – so quick. My mum used to make us play dough when we were little and I loved it. Like the idea of no salt so if my little is tempted to eat a bit theres no harm done and no risk of being sick! What I like about this receipe is that it does not dry out your hands bacause of the corn starch mixture. Remember the cooking addage: “Wet into Dry” Add coloring into the water and, blend that well. I used the cheap-o, non-sugared Kool-aid for coloring, and I found that powdered coloring worked far better than liquid. Just make sure it is completely dissolved or in the final product, you will have messy streaks and messy stained hands. The critical step in the cooking process is incorporating the corn starch and baking soda into the water before adding any heat. Make sure both are well mixed into with cool tap water, no lumps or bumps…once you add heat, it will thicken up pretty quick. Cook this concoction over medium heat – don’t rush the process. 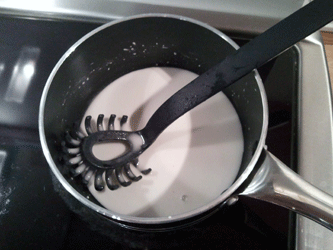 It is done when it begins to ball up on your wodden spoon and pulls away from the sides of the pan. Remove the pan from the heat, and plop the playdough down on a corn starch dusted countertop or chopping board. Once it is cool enough to handle, but still warm, knead it til smooth and roll it into a ball. Your product should be uniform in color and smooth. Cool completely (otherwise you’ll invite condesation and mold to the party) and store in an airtight container. I used to store ours into the refrig and take it out about an 1/2 hour before any activities. Troubleshooting: If it turns out too sticky or gooey, try cooking it a bit longer. Failing that, knead it with some more corn starch. If it is too hard, add a bit of corn starch water, a few drops at a time. DON’T ADD COLORING AFTER IT IS COOKED! Trust me, it will not work. I used to use Sta Flo, a liquid corn starch, the kind you’d use for your laundry, especially for the blue colored playdough. I found it was easier to use, but it does tint the dough a bit. I followed the one commenter’s great directions, and mine turned out really crumbly. What did I do wrong? I’ve always followed my recipe and it turns out great (for me anyway).Maybe you used too little water? I do not have enough bakeing soda…….. What should i use? It looks like a great recipe though!! How is that possible? Dry AND sticky? Hehe. I am a nanny and just made this with my 2 year old twin boys. They love it, made blue dinosaurs with it and am seeing if it will dry. Fingers crossed that it does. Glad to hear! It should dry, but it might get brittle. is corn starch the same as corn flour? Can i use corn flour instead of corn starch for this recipe? I don’t know if it will work, but corn flour (masa) and cornstarch are definately NOT the same thing! is baking soda the same as bicarbonate of soda? 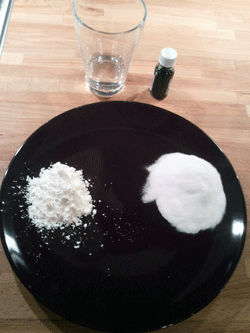 How much of bicarbonate of soda should be used? I think so, but someone else might be able to comment. I just made this. It seems to be a nice texture. I cooked it and then divided it into 2 balls and made it two different colors. Adding food coloring at the end worked with no problems. 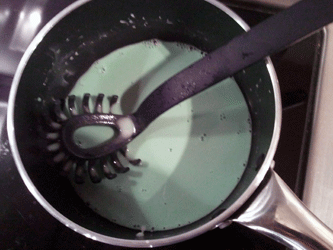 You can also use a couple tablespoons of dry jello to make the color. I added it with the dry at the beginning because we didn’t have any food coloring. Worked great, cherry jello made pink dough. Absolutely, just like in our Jello Playdough Recipe. We are doing a team building at my work & we are getting teams together to make “What spring means to us” with Playdoh. We need to know how do you get it to stay hard like forming a Easter basket sides to stand up? Hmmm….tough one. I think I would go for one of the recipes with salt in them. I’m no expert when it comes to big vreations like that though. Good luck! I just made it for my girls, and I added essential oil to it. I used lavender, but next time I’ll use eucalyptus. It worked really well. Its nice to incorporate a bit of aromatherapy while they are relaxing. Thanks for posting this! The play dough stuck to the bottom of the pot and i can’t get it off!!!!!! I’m sorry to hear, make sure you don’t heat it too much. Hi, this is a great recipe. Use it at christmas to make ornaments with. Bake in a slow oven, 200ish overnight after cutting out. Can be painted and glued. Really cute with googly eyes. Keep it thin about 1/4 inch thick. Thanks for sharing! My daughter came home sick from school today and was totally bored, so I mixxed up a batch of this. Before cooking I seperated the liquid in two bowls and made two different colors. It stuck to my pan a little but came off really easily with hot soapy water. I was short about 1/8 cup of baking soda, but it still came out perfect. Worked great for us, though my 2 yr old daughter cried when I told her she couldn’t eat it. So looks like I will be trying your edible recipe next! I just stumbled upon this website when I couldn’t find our kid’s craft book with the playdough recipe we always use. I have to say that this site is AWESOME. I love the wide array of recipes and cool ideas! Thanks!! This is one of my favorite dough recipe. I have Christmas ornaments I made from it 30 years ago that are still beautiful.